Did you know that undergraduate students at UBC "retain copyright in all works created during their course of study. Graduate students retain copyright in their own works (including theses) unless a research contract in support of the student's work dictates otherwise" (excerpt from: Student FAQs - Copyright at UBC). This means that you can apply an open license to your work if you want to share it so that others can build on it. You may also choose to use or build on the work of others. Learn how to license your own work and find, adapt and attribute work created by others. While the internet makes it easy to create and share your own work and be inspired by the work of others, some people make their living from original works. Copyright law allows them to protect their work. On the other hand, there are others who like to create, share and remix on the open web. To let others know that their work is available for re-use (in the way that they specify), open licenses were created (called Creative Commons Licenses). Mouse.org has produced an excellent introduction to the open web and an overview of CC licenses (we have borrowed the title above). They include a handy chart to let you know exactly what you can and can't do according to the terms of the various Creative Commons licenses. They also include a beginning reference list for locating openly licensed content (such as music and images). Why choose a Creative Commons license? 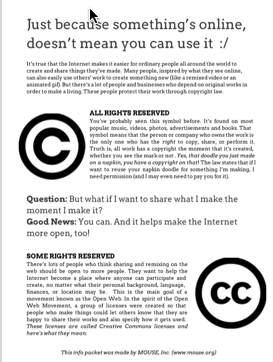 Basically, a Creative Commons license is useful if you want to let people know that your original work is open for others to share or build on as long as they attribute you as the original author. Considerations before licensing your work. Creative Commons provides a license chooser to help you select a license based on your preferences. Now that you have selected a license, you'll want to apply it to your work. Creative Commons can help with that too, by showing you how to apply your license in a variety of formats. Creating and publishing to YouTube? You can also select a CC license for any video you upload to YouTube. This will allow others to find and build on your work or access it for remixing using YouTube's video editor. More about CC licenses on YouTube. Adjusting licensing and permissions on YouTube - how-to with screen shots from Jorum. Where can I find openly licensed media? I'm creating a remix - how do I combine licenses or re-license for re-use? Choose two works you wish to combine or remix. Find the license of the first work on the first row and the license on the first column. You can combine the works if there is a check mark in the cell where the row and column intersect. Use at least the most restrictive licensing of the two (use the license most to right or down state) for the new work. If there a cross at the intersection of the row and column then you can not just these works. This probably indicates that one of the two licenses may not used for commercial purposes, or one of the licenses does not allow for derivative works to be created. 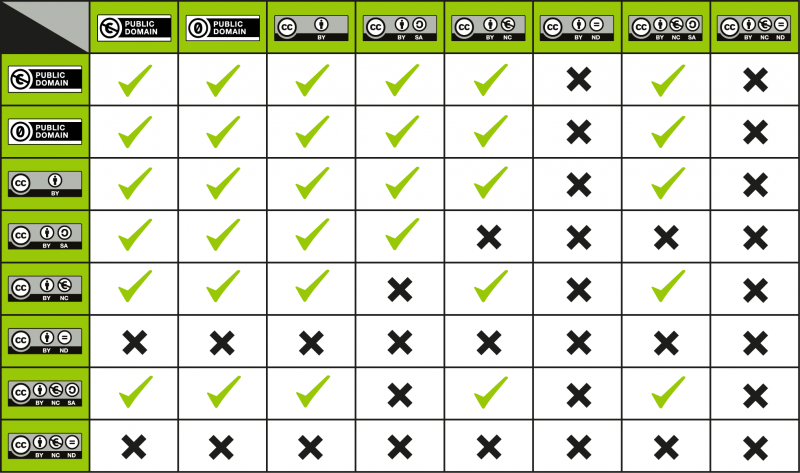 Creative Commons - Wiki/cc license compatibility . How do I attribute/cite an openly licensed work? Why Should I Care About Copyright? : Student's Guide. Video: Creating OER and combining licenses: learn how to license a new work (remix) you create from someone else's original. Need Help with Copyright and Permissions? Open Course & Education Resources Guidelines - Guidelines for using open education resources and teaching open courses. For additional help, contact the Scholarly Communications & Copyright Office or attend a workshop.